Ready, Set, Relax! It’s sometimes difficult to take the time out of our busy schedules to focus on your most important accessory: your face! We get too caught up in daily tasks to remember that taking care of ourselves should be one of our top priorities. The SHAW Center’s Spa is an oasis complete with treatments and skin solutions that will leave you wondering why you ever waited so long to make a visit. The best part of the Spa is that its services are easily catered to fit your needs and require little to no down time. 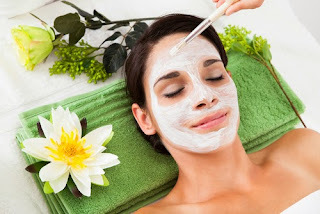 Skin Peels are incredibly beneficial to maintaining that beautiful complexion of yours. Chemical peels can help to repair skin damage caused by sun exposure, minimize facial lines, as well as improve the overall skin tone and texture of your face. Things that may affect the depth of a peel include the acid concentration in the peeling agent, the number of coats that are applied, and the amount of time allowed before the acid is neutralized. There are different types of peels you can opt for depending on the area you want to target and intensity of results. AHAs are the most gentle of the three offered at The SHAW Center Spa. They simply aid in smoothing and brightening your skin through the use of a group of glycolic, lactic and fruit acids. This particular procedure has the shortest recovery time and takes 10 minutes or less. TCAs penetrate the skin more deeply than AHAs and are the preferred chemical solution for darker-skinned patients. This particular peel treats fine surface wrinkles, superficial blemishes and pigment problems. The deepest penetrating peel offered at The SHAW Center Spa is Phenol, which treats more difficult skin problems, such as coarse facial wrinkles, precancerous growths and severely blotchy or damaged skin caused by sun exposure. Our center typically only uses this peel on the face and around the mouth. Our center also offers Microdermabrasion, which is a non-surgical, exfoliating treatment for those wanting to rid themselves of age spots, freckles, fine lines, scars and rough skin. While this procedure has similar results as chemical peels, they do employ alternative techniques. A chemical peel achieves exfoliation through the use of chemical agents and is typically followed with a longer recovery process. Microdermabrasion is an exfoliating treatment, but does so by simply “sanding” with minimal to no downtime. The Spa also offers services, such as Visia Analysis and an extensive line of well-trusted skincare products. So take the day off, kick your feet up and allow us to spoil your skin by enhancing and repairing its natural beauty!